Modern medication is a good thing, but a short course of antibiotics can deplete your gut flora, an internal culture essential for health and beauty. 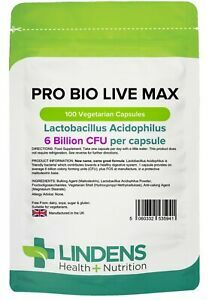 Lindens Improved Probiotic Max 6 Billion CFU 100 capsules are free of gluten, salt and dairy constituents, such as lactose. Adult men and women will benefit from a regular intake of this product. The unsweetened capsule will not add to calorie count. 96.719 objets sont disponibles. Saisissez un chiffre inférieur ou égal à 96.719.